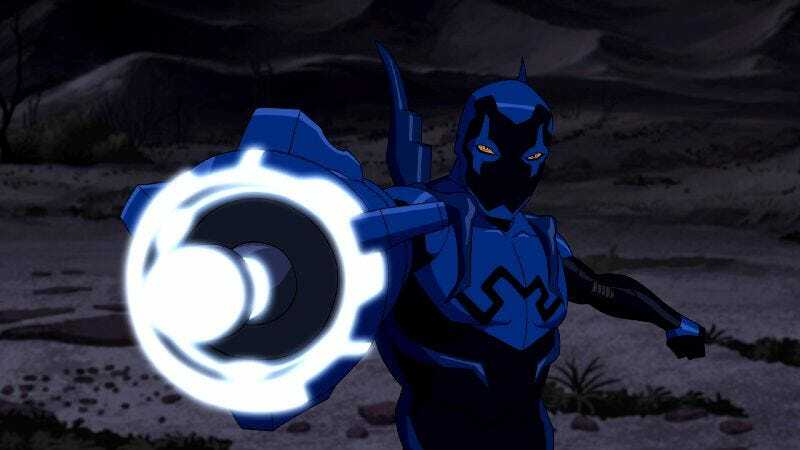 After last week’s breather, Young Justice dives head-first back into this season’s invasion storyline with an episode that spotlights Kaldur’ahm and Blue Beetle, two characters that establish themselves as major players in the interplanetary conflict after this chapter. As a double agent for the team tasked with infiltrating the Light, Kaldur is constantly having his allegiances tested, and he still needs to prove himself to his father if he’s going to acquire all the information that Young Justice needs. The Light still needs more metagene subjects for its mysterious alien partner(s? ), and Kaldur is sent out with Icicle, the Terror Twins, and new right-hand-woman Tigress to bring in some of his old teammates. This episode does a fantastic job balancing the old and new casts of this show, giving some spotlight to the newer characters while still devoting ample time to characters like Kaldur, Artemis, Nightwing, and Superboy. Yup, despite being dead, Artemis continues to be in the field, although she’s now taken on the name Tigress, the costumed alter ego of Artemis’ comic book counterpart. The Tigress redesign is fantastic, with a cat mask that calls to mind Artemis’ sister Cheshire’s grinning feline face. 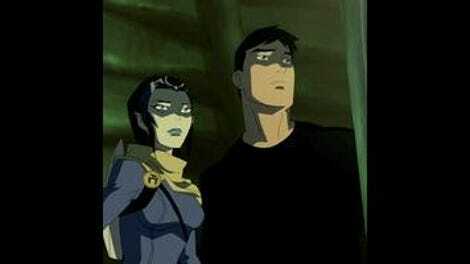 It’s a good thing that Artemis is around to keep an eye on Kaldur, because this episode’s events suggest that he’s falling into a darkness that he may not want to escape. Blue Beetle and Impulse are Kaldur’s first two targets, ambushed while showing off their powers to each other. The Scarab finally gets the chance to cut loose in this episode, although it’s host tries to keep it subdued for as long as possible. When Bart first comes to Jaime’s house (out of costume), the Scarab immediately registers the hero as a threat and suggests for Jaime to destroy his teammate. Throughout the episode, the Scarab is constantly telling Jaime that the best course of action would be to simply incinerate everyone, hero and villain alike. This lends even more credence to the theory that the Reach is involved with the invasion. The two heroes are able to escape the attack and steal Kaldur’s tracking device, bringing the piece of alien tech into Mount Justice, which was the plan all along. The Tracker is a Trojan horse that hacks and bypasses the base’s security, allowing Kaldur and his team to infiltrate the mountain and incapacitate the team with power inhibiting collars. In a nice touch, Wolf hears/smells someone during the initial moments of the attack, but doesn’t attack because it’s a familiar scent: Artemis. She collars him while the rest of the crew goes after Beast Boy, Superboy, Nightwing, Blue Beetle, and Impulse. As always, this episode features some great action sequences, particularly for Beetle and Impulse. When Icicle tries to ice over the floor so that Impulse can’t get traction, the speedster just runs up the walls instead and starts waling on the villain. With his sonar and staples, Blue Beetle manages to be the last man standing, but when Kaldur reveals a bomb that could turn Mount Justice into the new Marina Island, Jaime stands down and gets collared. Leaving Nightwing and Superboy behind because of their lack of a metagene, Kaldur takes the rest of the team hostage, a plan that the Scarab doesn’t agree with one bit. It shuts down Jaime’s collar and takes complete control over his mind and body, nearly taking down its opponents until Kaldur and Tigress use the one-two combo of magic and sedative to knock Jaime out. They take the heroes on board with them and once they’re a safe distance away, detonate the bomb inside Mount Justice. Right before Tigress hits the switch, she takes off her mask and there’s a shot of her with blonde hair, and then it immediately goes back to black. I guess the writer and director want to make it clear that Tigress is Artemis, but they could have done it in a way that doesn’t look like an animation mistake. Nightwing, Superboy, and Wolf escape the explosion, which has all been part of Kaldur’s plan to infiltrate the Light. Or has it? Wally goes ballistic when he finds out what happened, but Nightwing explains it all: Kaldur implanted Lagoon Boy with a tracking device, and when he broke into Mount Justice, he handed Nightwing a flash drive with valuable information on it for retrieving his teammates. Did Kaldur have to blow up the team’s base? No, but if it will get them closer to learning more about the Light’s operations, it’s a sacrifice worth making. Wally responds to this by pointing out that the Light just took three more of their teammates hostage and blew up their base of operations. If Kaldur’s pretending to be a bad guy, he’s doing a damn convincing job. Wally thinks Kaldur is a triple agent, using Nightwing to gain information on those looking to stop the Light and its alien partner(s?). Surely enough, the episode ends with Kaldur being inducted into the villainous group after his impressive work, but I continue to have faith that he’s still on the side of the angels. Why else would he have Tigress with him? Why would he give Nightwing the flash drive? It’s possible that he’s luring his teammates into a trap, but anything is possible. Wally is letting his emotions complicate the team’s plan rather than trusting it to work on its own, and he’s going to compromise a lot of people if he’s not careful. While all the high-stakes drama is unfolding, there’s a fun little subplot involving Mal’s failed night out with Karen, giving some attention to two of this show’s minor characters. In an episode that is so focused on superhero action and alien invasions, it’s nice to have a nice human story about how people’s priorities change with age. Mal wants to take Karen out to the movies, but she still needs to put in a few hours in Dr. Palmer’s lab. He offers to join her, assuming that they’ll do something fun after, but then Dr. Palmer shows up and pulls Karen’s attention in another direction. She’s not interested in doing the things they did when they were teens, and she’s taking advantage of the opportunities she now has as an adult. These small, more personal plotlines may not add much in terms of the overall narrative, but they bring depth to these characters that makes the viewer actually care when major events do happen to them. This week’s DC Nation: More Teen Titans (presumably to build interest for their relaunched series) with Raven and Robin in love, but not with each other. Robin learns French so that Starfire will kiss him and learn the language, as Tamaranian’s do, while Raven goes on an emotionless, monotonous date, which is exactly the way she likes it. Then there’s an Aardman Batman short that featues a bunch of claymation figures giggling at each other, a silly idea that has had surprisingly high comedic returns. Way to go, stupid Cartoon Network logo cutting off the end of all the subtitles. Blue Beetle’s giant staple gun is amazing. There’s something about aliens that speak in clicks that is really creepy and unnerving (see: District 9). Beast Boy is watching “Hello, Megan!” when Kaldur attacks Mount Justice. I’d really to see this show does a “Hello, Megan!”-style episode at some point in the future. Klarion could perform a spell that puts everyone in an ’80s teen comedy TV show.